I have a lopy with expansion board I have connected pin 4 of the lopy to pin 3 (tx) of a serial cable aswell as ground to ground. I am using cmd echo hello > COM9 from windows shell, but I get as a hex string as an output. WEIGHT(7): A seven character string containing the current weight including decimal point, then first character isa space. Leading zero blanking applies. STATUS: Provides information on the weight reading. The characters G?N?U?O?M?E represent Gross/ Net/ Underload/ Overload/ Motion/ Error. If the output is in HEX how can I represent this to POST in usable data? Can I use ubinascii conversion? I managed to get this to work thanks to your help, used a sparkfun MAX3232 to step down the RS232 to UART and ASCII strings appear as expected and was able to upload them to a web server. @jcaron damn that makes sense, so I would need some kind of step down can this be done by an ardiuno I have one lying around. I ommit that he say about RS232! RS232 is not an UART. And 5V levels can kill your lopy board it is 3V3 device. If you need to connect it to your PC use TTL converter e.g. USB->UART. You then can have virtual COM on your PC. Isn’t there an issue with levels? I.e. +/- 5V for regular serial port compared to 0/3V for the LoPy or something similar? @livius Yes my tx is on pin4 and rx on p3. I will try without expansion board thanks. Then only some wiring problem must be. For test connect also RX from converter to TX (P3). And look if all is ok.
And if possible test Lopy without expansion board. 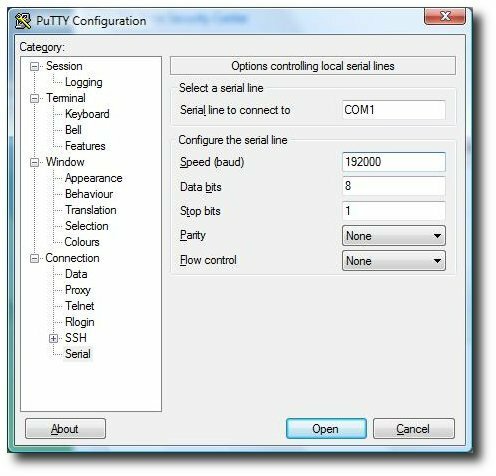 what is your putty com settings?